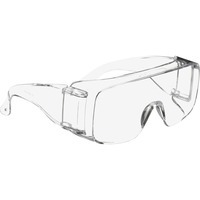 Tour Guard V Protective Eyewear offers economical eye protection to visitors who tour worksites or general use by others. Basic in aesthetic design, these glasses come with important safety features for overall eye protection, Impact resistant polycarbonate lenses absorb 99.9 percent UV rays and UVB up to 380 nm. Wraparound shields help protect eyes from flying objects. Use indoors or outdoors. The regular glasses have been sized to conveniently fit over most personal prescription eyewear and also fit most individuals. Clear lenses offer unobstructed viewing. These safety glasses meet the requirements of CSA Z94.3 2007 and ANSI Z87.1 2010.